Eastern Market has responded to community and flea market vendor concerns regarding the Department of General Services (DGS) planned takeover of the weekend flea markets with a public relations communications to the community assuring that the flea markets will continue largely unchanged under the new management. On Saturday morning, vendors of the weekend Eastern Market Arts and Crafts (A&C) Market (as distinct from the 7th Street weekend flea markets) received a notice from Barry Margeson, Department of General Services Eastern Market manager. The notice was addressed to the “Eastern Market Community” but apparently delivered only to the A&C vendors. 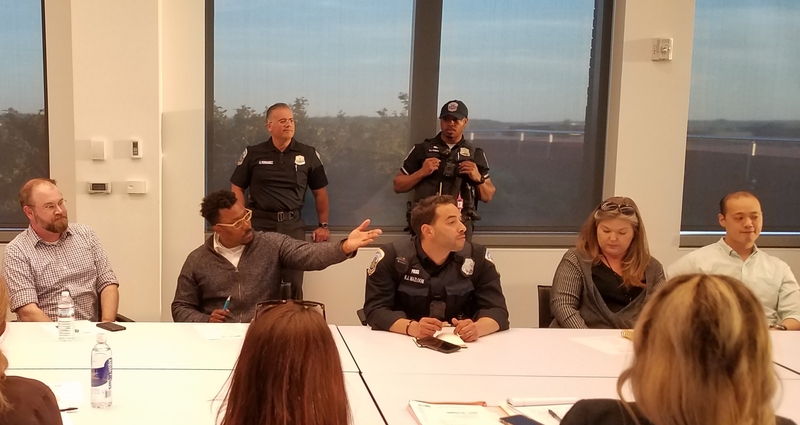 The notice began with the announcement – which flea market managers Mike Berman and Carol Wright had received last week as reported by CHC – that the flea markets were being taken over by Eastern Market because private use of the street could affect DC’s municipal bond rating. 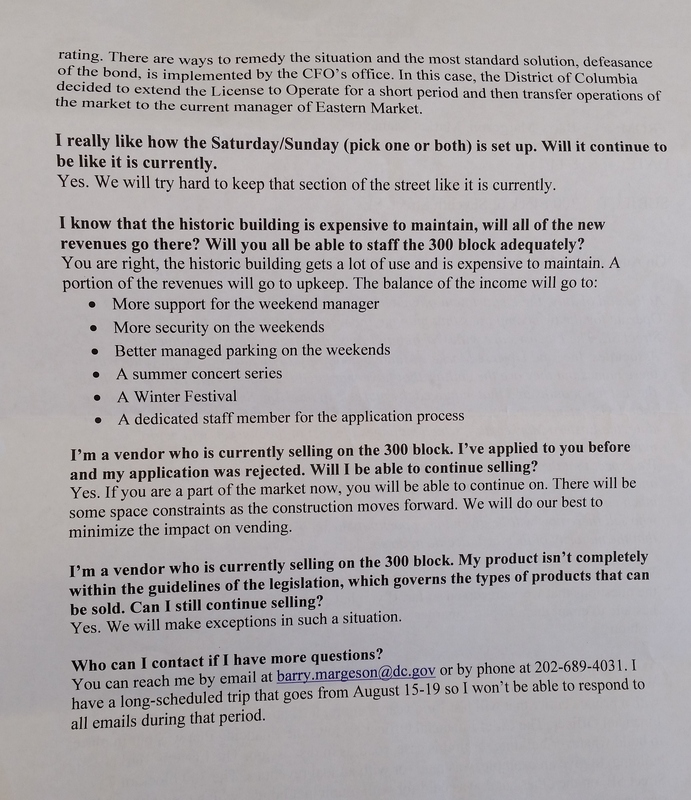 The letter explains that a portion of the revenues from the takeover will go to upkeep of Eastern Market, and the balance will go to provide more (staff) support for the weekend manager, more security on weekends, “a summer concert series,” “a winter festival,” and a dedicated staff member for the application process. 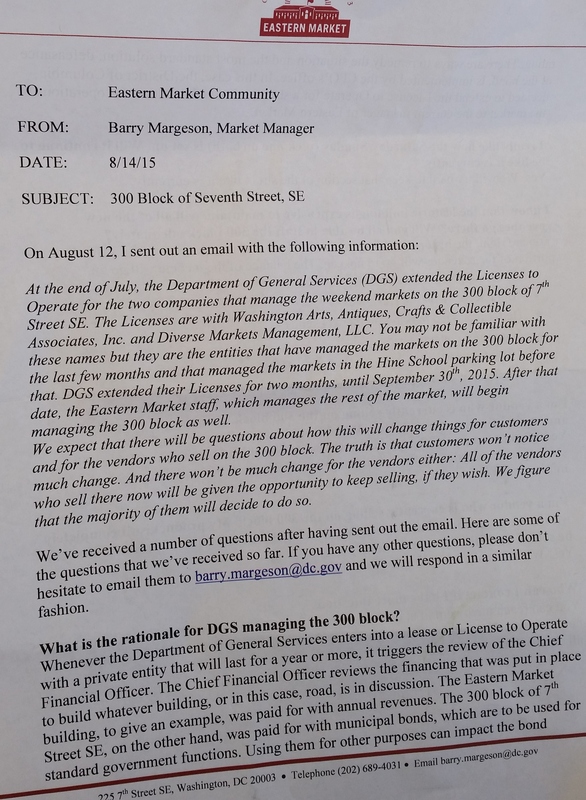 The letter states that “we will work hard to keep the 300 block as it is” and assures flea market vendors they will be grandfathered in as far as the tougher product quality standards which must be met by the Arts and Crafts Market vendors who are currently managed by Eastern Market. The language leaves open the likelihood that the tougher standards will be applied to any new flea market vendors. The flea market managers Mike Berman and Carol Wright vowed to fight the takeover attempt. Sunday flea market manager Mike Berman launched his own public relations “Save the Market Again” campaign, announcing a letter writing campaign to public officials and a petition to oppose the takeover. He also said he was pursuing legal options and investigating the claim that the move was based on the city’s Chief Financial Officer’s claim regarding the municipal bond issue. Berman says he has yet to see the CFO’s opinion in writing. The two flea market managers each pay the city $2000 a month under terms of their licenses to use the street – which is some one-third of the space they had on the Hine site, for which they also each paid $2000 a month. 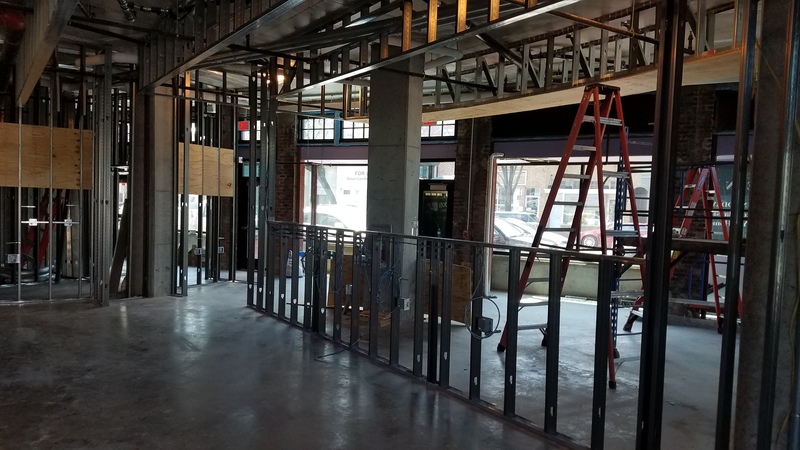 The move to 7th Street has already reduced the number of vendors to about half of those who had spaces on the Hine site at maximum occupancy. Whether the move has been good for the vendors depends on who you talk to – some vendors with need for a larger spaces say the move has hurt their business while most says it is about the same. Flea market vendors pay the flea market managers more for space than Arts and Craft vendors pay Eastern Market for roughly equivalent space, in part because the A&C vendors are managed by city employees. How the move by the city will affect the pricing of the spaces in both areas is uncertain. In meetings held by Councilmember Tommy Wells in 2010 to solicit community input for development of the Hine site, preservation of the weekend flea markets was the community’s top priority. Welcome your new government overlords. The Title 37 Law governing Eastern Market states that economic self-sufficiency is the ‘goal’. Financial self-suffiency is certainly the minimum goal every manager everywhere, but most managers don’t believe themselves entitled to achieve those goals by stealing some one else business. The implicit justification for this extraordinary attempt to seize independent businesses, is that somehow the flea markets are spin-off’s of Eastern Market. The sad irony, in the case of the Sunday flea market – Diverse Market Management, is that it founded and innovated outdoor vending on Sunday’s thirty years ago. It is EMCAC and DGS who are the relative newcomers, who’s only innovation has been their continuous attempts to appropriate the work of others. I am an artist at Eastern Market proper, and would theoretically gain from revenue’s stolen from the flea markets, except that most of us at the market are certain that this new revenue would be quickly squandered by government management. Many of us who live by making things with our hands that we sell to our beloved community of Capitol Hill, are utterly disgusted by this action, worthy of a banana republic. I think this was shady, and reflects upon the dynamics of the Hine Development in toto, but I don’t really care who runs the market. But I’m just wondering how free a vendor feels to email Barry with “any” question whatsoever, given that he will soon be her new landlord and could easily eject her stall from the market. As a long time vendor in this community institution I am horrified and disgusted by this move. If what the City really wants is more revenue to maintain their market, they can easily increase their revenue by charging more for their spaces. They currently charge peanuts ($28-$44) compared to what some of the same vendors are paying to the private businesses ($100-$175) for the same size space. Even asking all their vendors to pay $10-$20 more would make a great difference. If they where better at calculating their own finances and what they can fairly charge vendors, they would not need to do this. They City run market exists because of the people over at the privately run Sunday market. These original vendor who set up the market over 30 years ago are now having their work stolen from them. They are sighting some fine legal BS to justify their action. In no way is this RIGHT. And if the law is meant to administer Justice, then this action by DGS is illegal. They are stealing the work of others. It’s that simple and that ugly. Intentional or not, the city laid a trap for the flea markets. During the self-congratulatory backslapping all around for the self-declared brilliant workaround of kicking the flea markets off the Hine property and out into the street, rather than acceding to public demands to accommodate them onsite, where was this little detail about the bond market and the use of the public street? No wonder the developer was so eager to own the new C Street. Many feared it harbored the same type of thieving intention to usurp the flea markets for itself. Nobody expected the city’s bumbling bureaucrats to beat them to it. How disingenuous to rely upon the fact that most consumers are unaware of the identities of the parties behind the managements of the various markets to bolster an argument that a “transfer [of] operations” is essentially inconsequential. Eminent domain requires a process, not a sleight of hand. Anything else is theft. The stated excuse just seem ridiculous. Farmer markets all over DC make temporary use of city streets without harming any bond rating. The relatively new one in the Penn Quarter area, for example. I get that the private marker organizers don’t have a right to the street space but it seems the city negotiated in bad faith during the many months of negotiations over how to handle the transition. I love the way the City bends over backwards to say the vendors and the customers will feel/see no difference. What a huge lack of uderstanding – particularly for the vendors, people like Joe Snyder (see earlier message) who have made the street market the draw it is. And how disgraceful it makes no mention of the operators – Mike and Carol. They pay $2,000 a month each and are not worthy of being considered in this totally off-the-wall development. If this was happening in any other country – ie the ones we like to pick on, as in Russia or China, for not doing things correctly or democratically – it would be headlines! Sign Mike’s petition everyone. The on-going dysfunction around Eastern Market and the adjacent market just amazes me –and aren’t some vendors way way way behind on rent [looked for but couldn’t find a citation but am pretty sure this is true –happy to be corrected]? 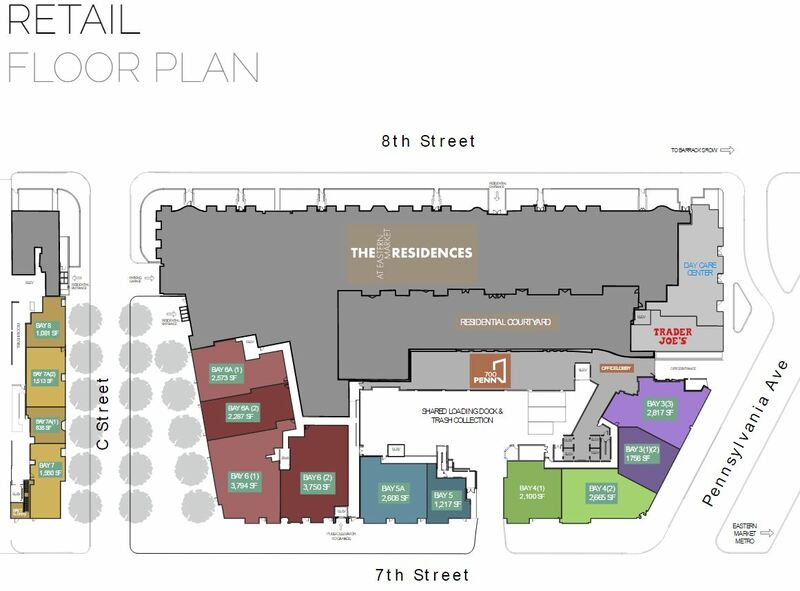 I really like Eastern Market and shop at Canales and the seafood place regularly but if it takes this much effort, squabbling, and taxpayer money to keep it afloat then maybe its run as a market is over and the building needs to be morphed into something else. Sometimes problems are unsolvable because the goal is impossible. We owe a big “thank you” to the Eastern Market gang for providing a bit of humor at the end of a long summer. The bit about the city’s bond rating being jeopardized by a small street market is a real thigh-slapper. And there are some OK jokes about the idea of the Eastern Market management team putting on a schedule of summer events and a winter festival that are pretty funny. The one about hiring additional staff to provide the services now provided at no cost to the city, such as handling applications, is a pretty good one liner. Best of all, however, is the core joke on the community that involves the assertion than an unspecified amount of money will be allocated to address unspecified resource problems at the Eastern Market to fix unspecified issues according to an unspecified plan of action. Slapstick appeals to everyone. Having named The Flea Market at Eastern Market when I began managing it on Sundays in 1984 and continuing still in its operation as a partner in DMM, which I spun off and funded more than 11 years ago and which purchased rights to the flea market from me in 2011, understandably, I am disheartened that I will no longer be able to continue in what has become my life’s work after Septermber 30. But I am not so much worried about myself as the assets not only DMM and the City but also the neighborhood are losing by the take over of our business. These include EasternMarket.net which has drawn millions of visits and contains a valuable history of the Sunday outdoor market at Eastern Market as the first ever web site devoted to the historic market and The Flea Market at Eastern Market, a facebook page with more than 10,000 followers for its many postings. Certainly the most important asset the city will be losing is outdoor market management experience. DMM and its staff represent more than 125 combined years of such management, not only at Eastern Market, but also at several other markets around the region, including The Downtown Holiday Market now recognized as one of the best in the US along with The Flea Market at Eastern Market, recognized as one of the best in the world. I am concerned mostly about our employees, many of whom are supplementing Social Security income, who will be losing their long-term part time jobs. On many levels, among those cited here, the seizure of our business IS JUST NOT RIGHT!